Hammonasset State Park contains Connecticut's largest beach and isTHE summer destination area, enjoyed bv millions of visitors yearly. Containing two miles of curving beach, with about thousand acres of assorted wetlands, trails and campgrounds, this park is definitely worth a visit. Situated in Madison, along Long lsland Sound, the park opened in July of1921 and is named for the local Hammonasset tribe of Native Americans. "Hammonasset" means "where we dig holes in the ground," a reference to the tribe's agricultural practices, farming corn, beans, and squash. Today, the land is a preservation and recreation area. During the off-season, visitors can walk along the boardwalk or nature trails. The park is also host to a myriad of events, including mock Civil War encampments, each year. Bird-watchers are thrilled by the hundreds of species know to nest at and visit the area, including loons, petrels, egrets, herons, swans, ducks, geese, vultures, bald eagles, falcons, hawks, owls, hummingbirds, woodpeckers, and many more. The Meigs Point Nature Center offers educational programs and activities for visitors year round. Follow the signs to Meigs Point; the nature center is in a small building with its own parking, across from the pavilion. lnside the building is a mini-museum of park life, including taxidermied birds, displays of shells, and a room of live animals in tanks (including various snakes, turtles, frogs and fish). The beach, of course, is the main draw of Hammonasset, and is separated into three sections: West Beach, East Beach and Meigs Point. Meigs Point is rockier, and offers a nature trail hike leading up over a hill to a hidden beach literally made of shells (hardly any sand). West Beach is closest to the entrance, to the right off the rotary. East Beach is the center beach, to the left off the rotary, with the point at the far end. Both the West and East beaches are sandy. A boardwalk runs from West Beach to East Beach. Dogs are not allowed on the boardwalk or beach, but a there is a trail, parallel to both the boardwalk and road, where you can walk a dog on a leash. Each beach has a pavilion with restrooms, changing facilities and a food concession. There is plenty of parking, with shaded areas for picnicking. 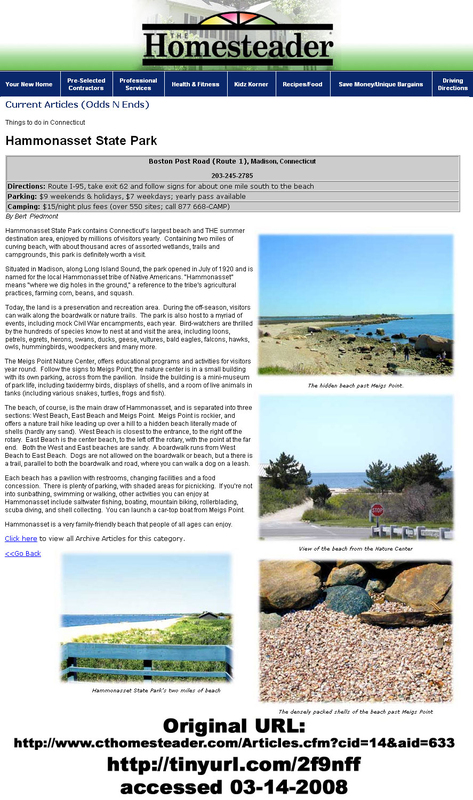 Lf you�re not into sunbathing, swimming or walking, other activities you can enjoy at Hammonasset include saltwater fishing, boating, mountain biking, rollerblading, scuba diving, and shell collecting. You can launch a car-top boat from Meigs Point. Hammonasset is a very family-friendly beach that people of all ages can enjoy. (c) 2007. Information may be out of date.